Last weekend I did a one day course on stingless bees (or native bees) with Tim Heard, through the wonderful Milkwood. Tim Heard is an expert on all things native bees and along with his friend Tony Goodrich presented a course that I haven’t stopped talking about since. Stingless Bees are amazingly wonderful and I am so looking forward to going further with this. My courtyard, local school, friends…yes, this is definitely going to happen. Watch this space I reckon. Stingless bees, let’s do this. How about you? Are you doing any courses at the moment? Got any experience with bees, native or otherwise? Or would you also like to get a stingless bee hive? Sugarbag.com for a cracking start to understanding what they are all about. Jump across to Milkwood for more awesome courses to do. This entry was posted in Connecting with Community, Photography and tagged bees, hives, milkwood, native, permaculture, stingless, tim heard by cityhippyfarmgirl. Bookmark the permalink. I think I’ve heard of these bees. Are they really small compared with other bees? Much smaller, and black in colour. Always leave some veg to go to seed in your garden. They love the flowers of bok choy etc and live with the other bees well. I love the little fellas. If only I had more garden Marilyn! Would you consider getting a hive? Interesting. Tony is talking about building some sort of nest/attraction feature (?) for native bees. Perhaps something like a ‘bee hotel’ Rose? These attract the solitary bees and give them a wonderful place to call home 🙂 Google images ‘bee hotel’…there are some amazing looking set ups people have done. Do find out. See if you live in an area that is suitable for the hives. They are absolutely fascinating…and needed! It’s an intricate hive isn’t it. Love that shot of the bee hive! Fresh honey, why not? I did the same course in Newcastle and was similarly inspired! Very excited to notice them in the garden afterwards and can’t wait to expand the population 🙂 Your pictures look different to mine though – was it the Tetragonula hockingsi that you saw? Isn’t it wonderful to come away from something so inspired. So, do you plan to get a hives/hives? Absolutely! Have ordered one and expecting it in November, I can’t wait! Too cold for you Ms Narf unfortunately. 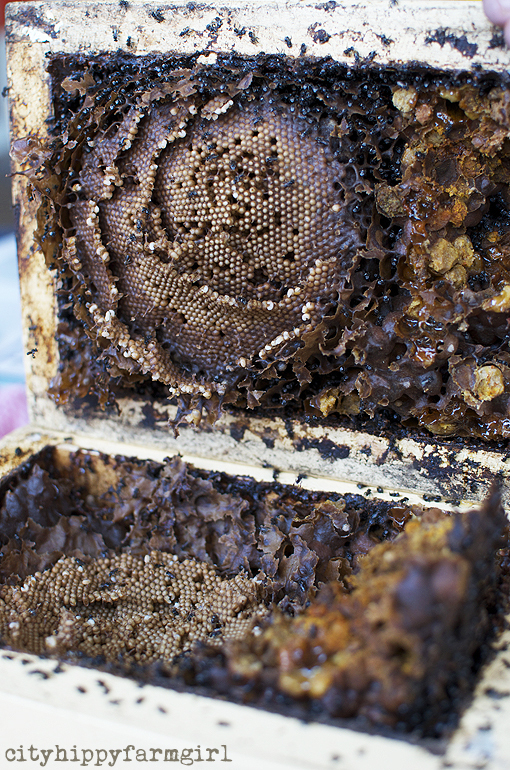 Would you ever consider a European honey bee hive in your wonderful garden?